Take responsibility for faults by Dr. Harsimran Singh. Learn how to be happy and wealthy from an immigrant who migrated to the USA with a total of $8 and is now ranked #1 when one Googles, "Rich Immigrants." 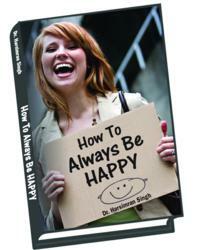 Dr. Harsimran is an author of 13 inspirational books. The following is an extract from his book "How to Always Be Happy," which may be very helpful for anyone to be happy and wealthy in life. Everyone wants to be happy in the world. But very few succeed in their efforts. Their practices, attitude and positive thinking help them achieve their expectations. Instead of discovering fault in everything around, one has to see that one is certainly accountable for one’s wrongful conduct, shortcomings, and problems. Through accusing other people for one’s own personal problems and shortcomings, people in general are doing a lot more harm to themselves than is done to them by others. Failure, as well as slip-ups, will happen but they are certainly just that, and of course, sometimes something positive originates from such events. One might question “How can a person be much happier?” “A person should enhance different aspects in life, continuously trying to perfect their own strengths and features, and they will emerge a more competent, dependable, as well as contented individual,” says the author. The author firmly believes that the more confident a person is, the greater responsibility one will be able to undertake. One has to learn how to lead by example, particularly if a person is kept accountable for more and more responsibilities and tasks, This means that one should definitely look for problems within oneself and one’s own choices or actions, when things go awry. Dr.Singh believes that taking responsibility for one’s problems as well as one’s actions can help in making a happier person. The person will know that being truthful with oneself will keep one moving toward being a better individual. Sometimes one should know that they cannot simply blame in a situation, it’s up to them to make it right for all parties included. One step that could make it easier to accept responsibility for their problems, wrongdoings, or even weak points would be to discover humility. Yes. One has to learn how to laugh at oneself, no matter how large or even small one’s mistake. That is not to say that one ought to mess up or even fall short and just accept it gently and humorously. The author is of the opinion that if everyone blames one another, they will fall short in improving themselves. No one is perfect and, if anyone present themselves as such, others will be less likely to accept them as friends, colleagues, and partners. Admitting fault is an important part in making positive changes in one’s life. Doing this makes more appealing because others can see us for what others are—human beings just like them. “Be true and genuine in character and the rest will fall into place,” says Dr.Singh. "Inspirational quotes are akin to a blazing fire. If fuel is not continually added, the fire gets extinguished. So keep on adding the fuel of positive thoughts," says Dr. Singh. Dr. Singh credits his success to Search Engine Optimization, which helped him have his websites ranked at the top of search engine results. He wants others to be successful as well. He wrote the book “SEO Secrets to BIG Money” (valued at $45.95), which can be downloaded for free by clicking SEO.